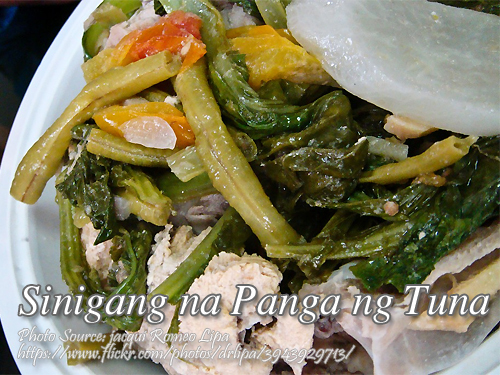 Siningang na panga ng tuna is one of the tasty dishes you can do with tuna jaw. The other is grilled panga ng tuna. Since the jaw part of the tuna does not have much meat in it, most you can find is the soft tissue and cartilages which is better cooked in a soup or some dishes with sauce. And one of best dish you can do is siningang. There are many souring agent you can use in making siningang and this recipe calls for fresh tamarind fruits. Make a tamarind puree by boiling the fruits in water until soft then mash it in the liquid where you boil the tamatind. Then sieve it to extract the juice. To cook sinigang na panga ng tuna; In a soup pot, combine water, ripe tomatoes and taro. Boil for 4-5 minutes or until taro is almost tender. Meanwhile, in a saucepan, boil tamarind or sampaloc in water until soft. Mash tamarind (sampalok) in the liquid to extract juice then strain liquid into a bowl, Set liquid aside and discard the sampalok. Add the panga ng tuna, finger chili and radish to the soup pot and simmer until tuna is almost cooked, about 8-10 minutes. Stir in reserved sampalok juice and season with salt. Adjust seasoning to taste. Place kangkong and string beans or sitaw on top of the fish and simmer further until vegetables are cooked just right, about 2 -3 minutes. 100 grams string beans or sitaw, cut into 2'' pieces. In a soup pot, combine water, ripe tomatoes and taro. Boil for 4-5 minutes or until taro is almost tender. Meanwhile, in a saucepan, boil tamarind or sampaloc in water until soft. Mash tamarind (sampalok) in the liquid to extract juice then strain liquid into a bowl, Set liquid aside and discard the sampalok. Add the panga ng tuna, finger chili and radish to the soup pot and simmer until tuna is almost cooked, about 8-10 minutes. Stir in reserved sampalok juice and season with salt. Adjust seasoning to taste. Thanks for the kind words and your rating. I’m happy that this blog has helped you in your cooking. Cheers! Thank you so much for updates on your Filipino recipes! This sinigang na panga ng tuna will definitely on my next list! Your recipes are simple and quite easy to follow…thank you so much Pareng Manny! Hi Tsag, I’m very glad that you like the recipe. Thanks for your comment.